The ASSA project is concerned with older people’s experiences, particularly related to health, and the impact of mobile phones on their lives. In Godown, my fieldsite in Kampala, this translates to a focus on the ways older people mobilise support for the health of an individual across family and community networks. Throughout Uganda, savings groups are a notable model of community support for individual health, popular particularly amongst the urban poor (Nakirya and State, 2013). Typically, a group of people meet weekly to save money together, with an opportunity take small loans from the savings. The Ugandan government have recently started to encourage savings groups “as a way of pooling resources together in order to facilitate development”. 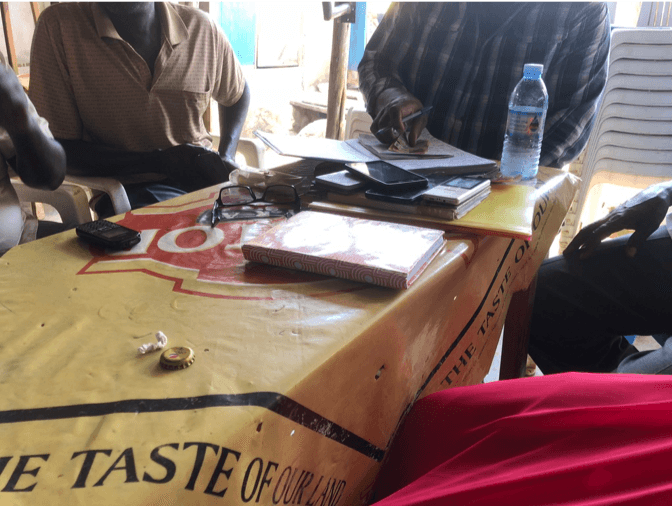 To better understand the nature of community support in Godown, I’ve registered as an active participant of a savings group of 15 members, predominantly older men, all from Acholiland in Northern Uganda. The group name translates to ‘Togetherness is Strength’ and was founded by a group of community elders after a child was stillborn at the local government hospital; the child’s father had struggled to fund the transportation for the burial in his home village in Northern Uganda, “he had to pool resources within the night, so he saw it was a very big challenge if we had not helped him. So that was the birth of the group”. Over 5 years, the fund has accumulated about 20 million Ugandan shillings ($5250), which means there’s now a collective resource for emergency loans. As explained by the group Treasurer, this is particularly useful in times of poor health, “in our community, the income levels are very low, so in the event of one of them falling sick, he cannot even feed himself”. They also recently bought one young man a motorcycle for business purposes, which he pays off in monthly instalments with interest, later to be shared amongst the group. 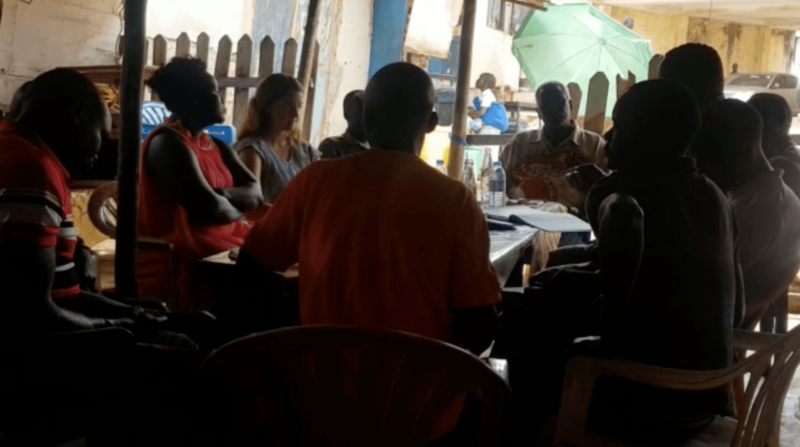 Every Sunday morning, they hold a meeting in a local bar, in which savings are counted and group elders advise their younger members (see image below). Whilst ensuring monthly contributions and loan repayments are maintained can be a challenge, the group represents the possibility of security through mutual collaboration, fundamental to individual, family and community health in Godown more broadly. As explained by the Vice Chairman, it is a “means of assisting ourselves, in times of grievance or happiness. We thought we should come together to form an association and make light the heaviness on one person.” Amidst conditions of socioeconomic precarity, savings groups such as this offer a form of risk mitigation through social insurance. There meets the traditional (ritual, conviviality, group solidarity) and the economic (financial and legal obligation, commercial organization) (Ardener, 1964: 222) ideals of this community, manifesting the experience of elder-led ‘togetherness’ in Godown. Ardener, S., 1964. The Comparative Study of Rotating Credit Associations. J. R. Anthropol. Inst. G. B. Irel. 94, 201. Nakirya, J.W., State, A.E., 2013. “Nigiina”s as Coping Mechanisms of Peri-urban Low-income Mothers in Kampala, Uganda. East. Afr. Soc. Sci. Res. Rev. 29, 31–57.